Israel holds the world record for the number of lawyers per capita, which generates enormous competition for clients and results in one of the lowest average level of lawyer's fees in the western world. Despite these challenging conditions, DLA PIPER, the world's largest law firm (about 4,500 lawyers in 80 offices in 40 countries) decided to set up an office in Israel with its major distinguishing point: providing direct access to the highest level legal services in all the world's leading economies. The media aim of activities - to inform the relevant target clients for the firm in Israel about the business and legal capabilities of the firm overseas; to increase recognition and familiarity of it; and to support and to assist its business activities. ‍The challenge – Israel's law firm market is saturated and competitive; and the concern about being perceived (mistakenly) as a threat to local firms; ban on publicizing the activities the legal/business activities of the firm's clients; zero advertising/ content marketing budget. ‍The strategy that was chosen – Leveraging the media on the various activities that were carried out in cooperation with local law and accounting firms, which do not provide rival services overseas – in order to get across messages such as: it is not only the world's largest, most professional and best connected law firm but also a law firm that does not pose a competitive threat to the local players. 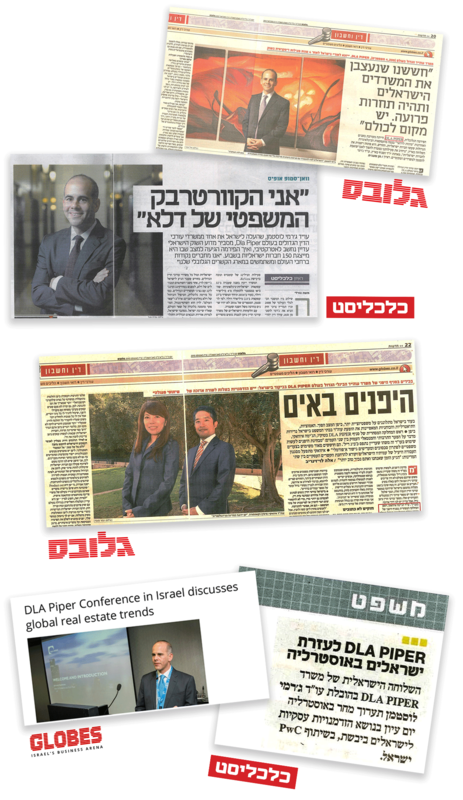 ‍The operative expression of the strategy is that in every media activity (based on organizational public relations) – we presented how DLA's massive international presence contributes to Israeli clients and acts as a 'tie-breaker.' In addition to dozens of articles in the financial media, in 2017 alone we arranged over 15 events of various types and sizes in a range of areas such as: real estate, taxation, infrastructures, technology, and more. For every conference, we put together a full program of tailored content and in every conference we achieved coverage based on quality content – without having to invest money. ‍The result - During its years of activities with our firm, the client has become one of the most well-connected in the Israeli economy and today represents a long list of leading companies. In 2017, DLA's team grew and the local branch transferred extremely large amounts of work to branches worldwide. ‍Recognition - Our firm's activities with the client won us the Israel Association of Media Consultants "Roaring Lion" prize for campaign of the year in 2018 in public relations. At the start of 2017, there were dozens of veteran players in the shared workspace market. Following the opening of its first center in London, LABS – an international co-working space chain, prepared for the opening of its first center in Israel. Its Israel offices were specially designed on the top three floors of Tel Aviv's Azrieli Sarona tower, with 2,500 square meters located in the largest floor space areas in Israel. This fact raised many questions about the ability to find tenants for such a large area – all the more because it was a new and unknown chain in a competitive market with veteran and dominant players. The media aim - to inform the target customers, which included leading technological companies and major startups, about the quality of the work area, so that would consider transferring their offices to the new work area. This was a complex challenge: to sell a 'non-existing' work area and recruit potential customers to a deal that was only 'on paper. 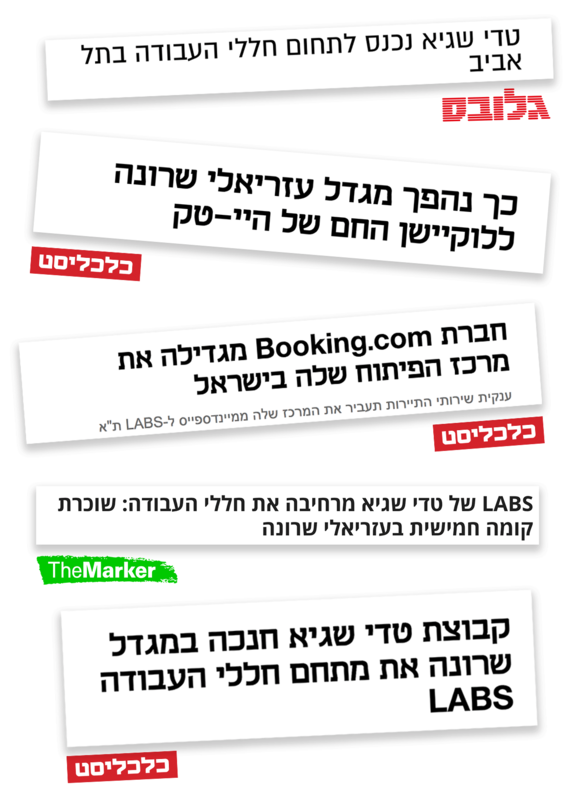 ‍The strategy that was chosen – Positioning LABS as a prestigious international brand located in a tower that was branded as a leader in Israel's high-tech sector. ‍The operative expression of the strategy was reflected in implementation that was based almost entirely on constant public relations work combined with many media articles and a focus on the relevant population as well as two major peak events that we created and exploited: the opening of TechCrunch week in Israel and initiating a technology conference in London. This was in addition to harnessing the existing branding for the tower to the new workspace being set up within it. ‍The result was beyond all expectations and by the time of LABS opening it already had 75% occupancy. Two months after the opening, the workspace was already fully occupied by leading companies. Following this success and major demand, two more floors have been set up in the workspace, which today encompass about 10,000 square meters and is one of the largest in Israel. ‍Recognition - Our firm's activities with the client won us the Israel Association of Media Consultants "Roaring Lion" prize for campaign of the year in 2018 in the technology and cellular sector.